Lush and beautiful Kerala is a joy to explore. As well as visiting the main points of interest, we get off the beaten track at many points to really give us a flavour of local life. Travel is as much about meeting people as it is seeing the sites, and there are many opportunities for both on this tour. Our local tour leaders are great facilitators when it comes to introductions and explaining local customs. We spend time on a traditional house boat and also a night with a family in their home, this gives an excellent chance to learn about the life in this tranquil state. We make use of local trains which is a great experience as well as reducing the amount of time we require a bus. Whilst in Periyar we are careful to follow the strict guidelines of our Animal Welfare Policy, developed in conjunction with the Born Free Foundation, when viewing wildlife so we minimise disruption. Our Tour Leaders are passionate about Responsible Tourism and brief each group on arrival. They are also on hand throughout the trip to offer advice on how to get the best from each location without causing any damage or offence, and by contributing to the economy. We stay in simple, small accommodation throughout the trip and groups are encouraged to minimise use of water in order to help the owners manage their resources. The maximum group size is 16 people. With a smaller group we can spend time with local families, enjoy time on houseboats and make use of public trains to travel between cities. It gives us the freedom to spend time talking to local people as we travel and truly immerse ourselves in the culture. Our village homestay provides us with an excellent insight into lives of the backwaters residents and is a welcome additional source of income for our hosts. 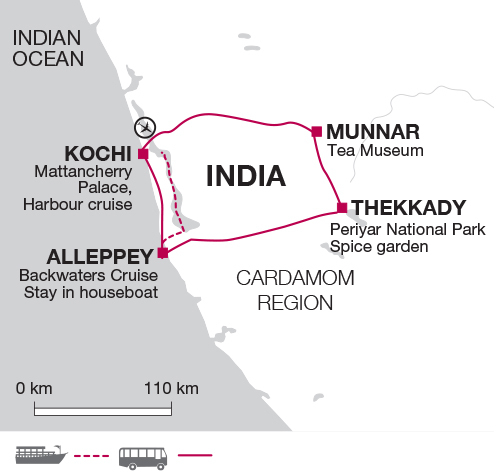 Choosing to stay in smaller hotels and homestays, using local leaders and eating out in a variety of local restaurants ensures that our tour really benefits local people in Kerala. Hiring a bike or taking a rickshaw tour helps in the same way and is incredibly good fun too!